Lately I’ve been reading a lot of books about family ministry. Almost a year ago, I purchased 5-7 books on the topic of parenting or family ministry and lately I’ve been burning through that stack. 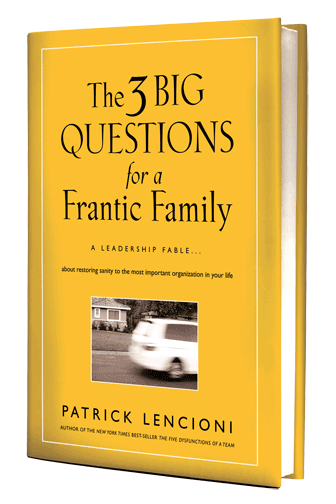 Last Friday I finished Patrick Lencioni’s book, “The 3 Big Questions for a Frantic Family.” I can’t even begin to tell you how great this book was. If you’ve read any books by Patrick, you know his style and technique and I’ve never found anyone who didn’t like his approach. Although he normally writes books for CEO’s and businesses, this one is aimed at the family. Why? Patrick explains that when he talks to CEO’s and executives in companies, they often talk about their families and how their families are even more important to them than their companies and careers, but most feel like their families are frantic and disorganized. 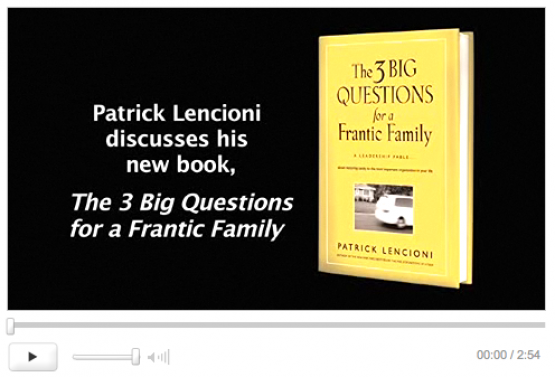 Lencioni recognized this in his own family as well and began to recognize the problem. Most parents don’t see their families as organizations, yet it is probably the most important organization they’ll ever be a part of. When parents stop reacting and begin to take action using some of the same principles used by successful companies, they might beÂ surprisedÂ by the results. When I closed this book, I was ready to get started. Sara and I are currently in a small group working through the book and study guide of Revolutionary Parenting and it’s amazing how much the two books worked hand in hand. We had some brief discussions and I’m excited to put some of the concepts from “3 Big Questions” into practice.Â Surprisingly, Sara and I have already written vision and mission statements for our family along with a list of core values. However, in about five minutes of casual talking, we identified 3-4 core values that are probably more true to who we are than the ones we wrote out a few years ago after much debate and planning. What I love most about this book is how simple everything was. 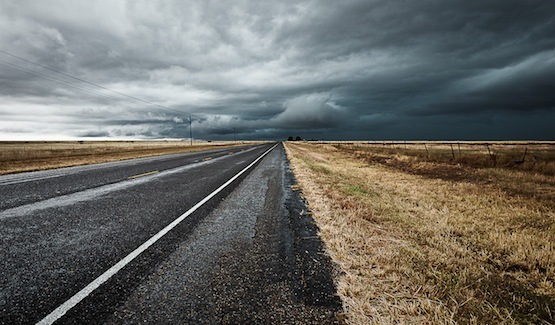 It wasn’t that he wrote ground-breaking new techniques and ideas, but simple steps to make getting a plan in place much easier than ever before and tracking progress something that isn’t dreaded. I really am looking forward to getting started. 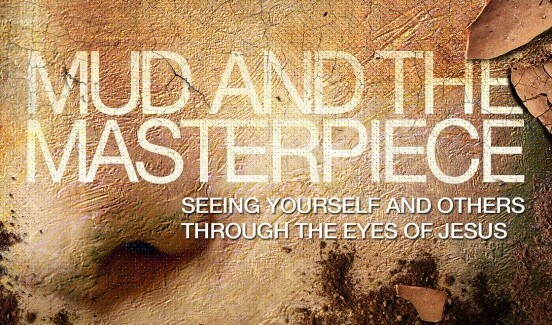 So, if you haven’t picked up this book yet, be sure to grab it here! Below, watch a video interview of Patrick talking about this book. NextDo you have a whiteboard in your kitchen? Sounds awesome! I may need to check this one out! It sounds like a book Cindy & I would enjoy! Yes, but I’d follow it up immediately with Revolutionary Parenting. After reading 3 Big Questions, you’ll be able to start using the strategy right away… with Revolutionary Parenting… you’ll have stuff to do right away but because your boy is so young, it’s more planning for the future. The books fit well together though. Hey man, this is by far one of the best books I have read for the family. 2 other couples in our community group also read it and said the same thing!